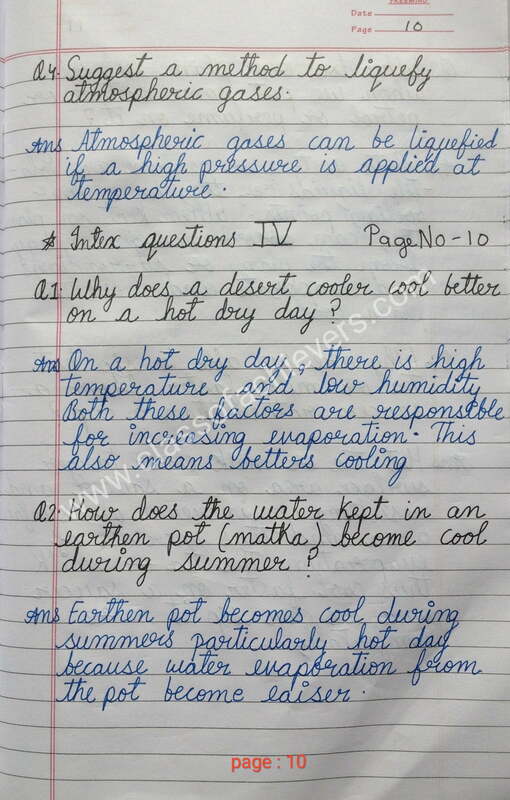 Hello students , In this page we provide you NCERT solutions for class 9 Science . 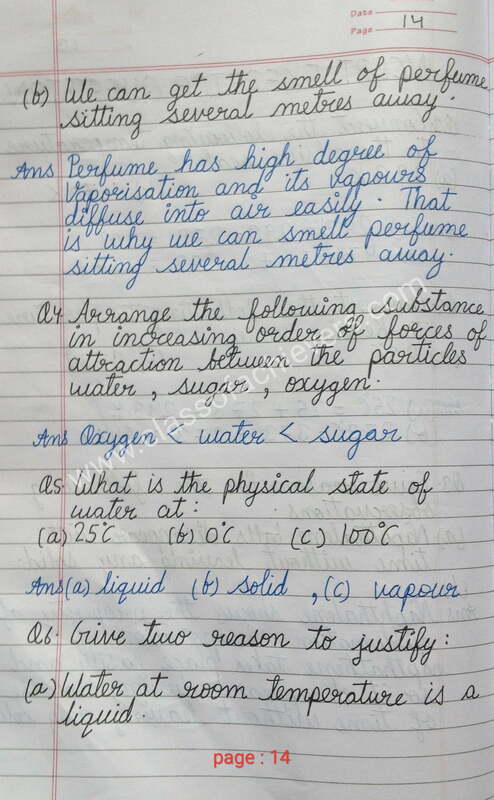 In below you will see class 9 science , it is available on written images content and later it will be appears on typing text content. 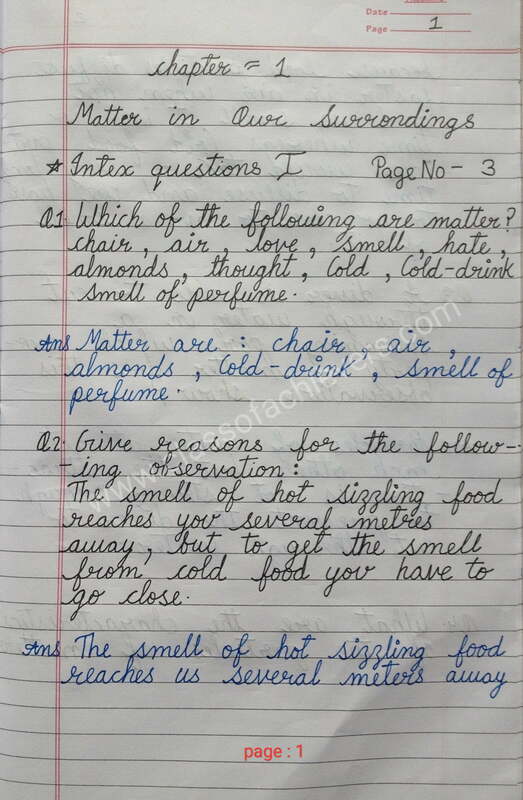 You can scroll it and find your solution which do you want to get solutions of any questions in your chapter. 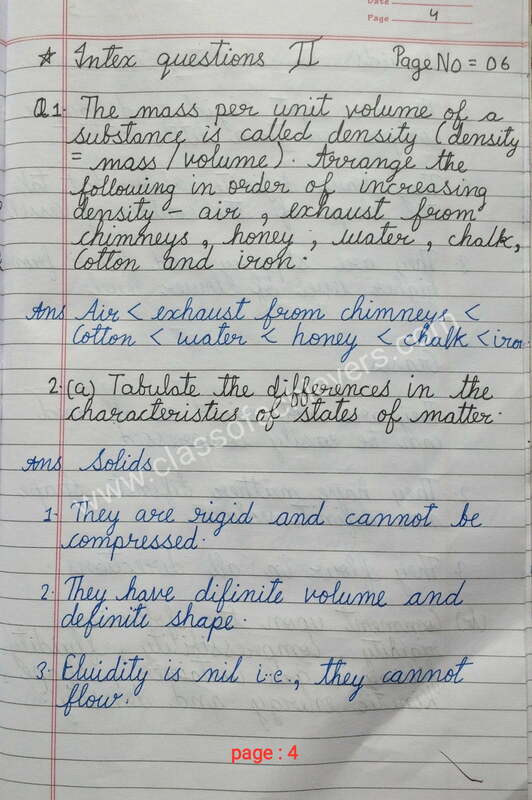 Also we provide you some extra questions for your practice for regarding to Class 9 CBSE exam. You can share our link with your friends or classmates and to help them to understand better about their subjects and clear their doubts. Ans. Matter may be defined as anything which occupies space, has mass and can be judged by one or more of the five senses. Que2. Name the different states of matter. Ans. Solid, Liquid and gas. Que3. 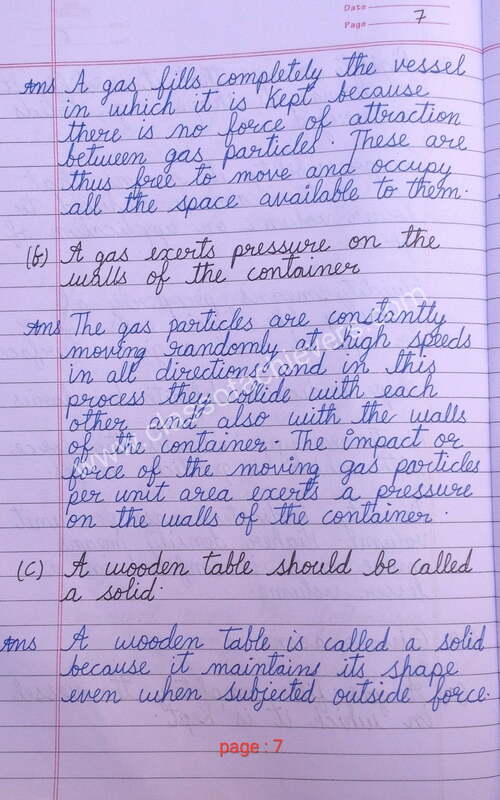 Explain why a gas exerts pressure. Ans. This is due to the bombardment of gaseous molecules against the wall of a container. Que4. 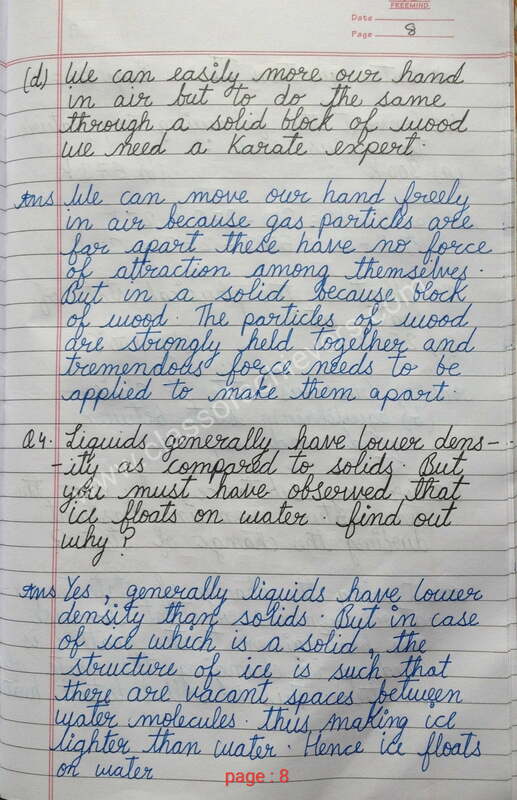 Both liquids and gases are fluids, yet they differ ? Ans. Although both liquids and gases can flow the magnitude of attractive forces in liquids is more than that in gases. Thus, they are different. Que5. 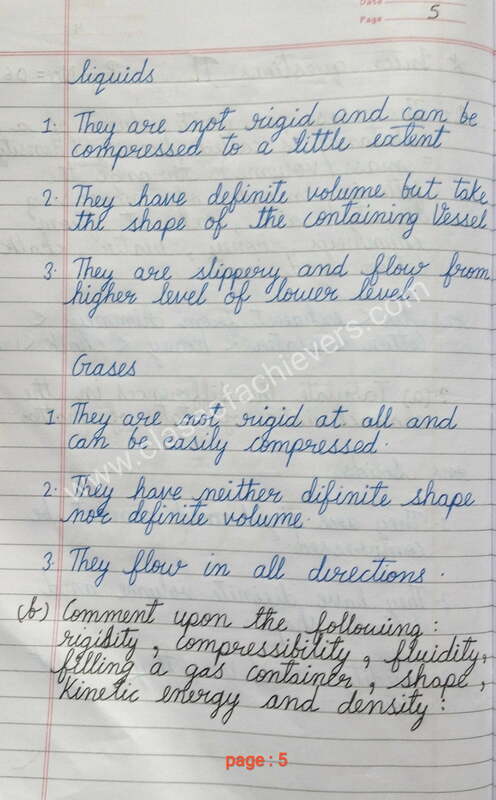 Why solids have definite shape and volume ? Ans. Because the vacant spaces between the constituent particles are very small in solids. 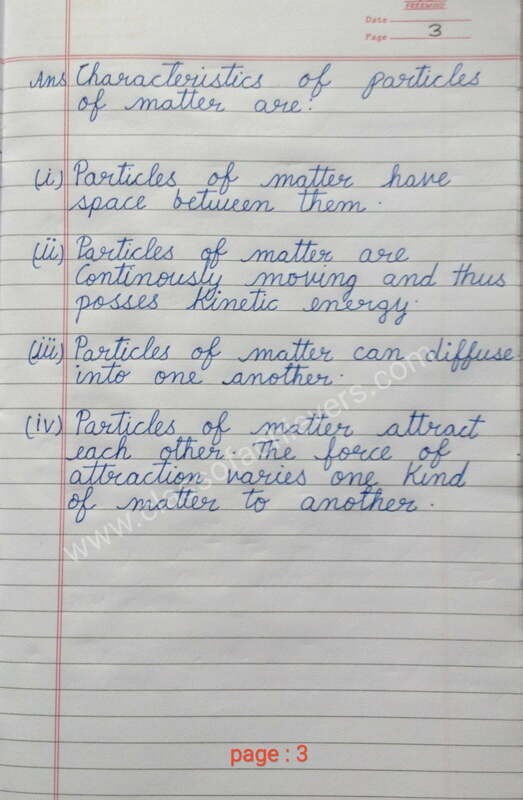 They are very strong forces of attraction between the constituent particles in solids. Que6. 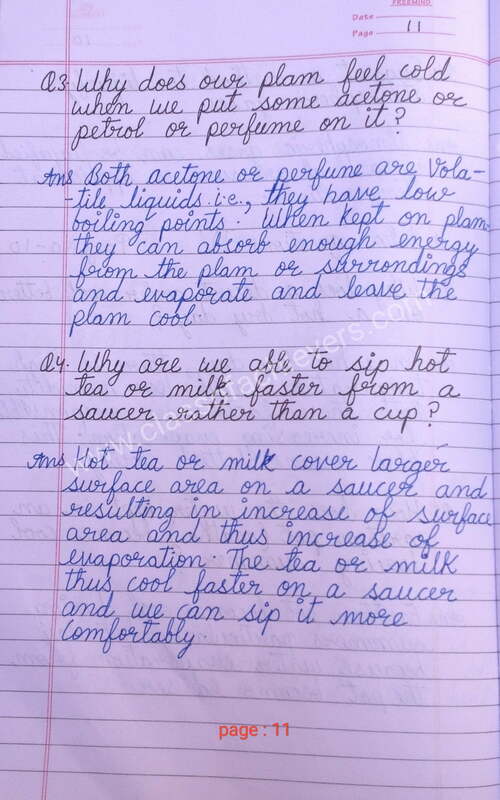 List out any two characteristics of liquids. Ans. 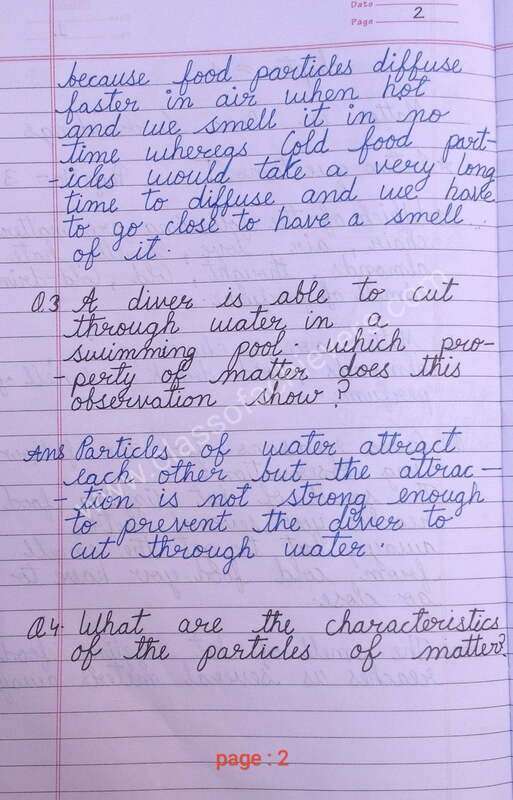 a) Liquids have fixed volume but not fixed shape. They can take up the shape of the container in which they are kept. Que7. Why do liquids have mostly lower density than solids ? Ans. 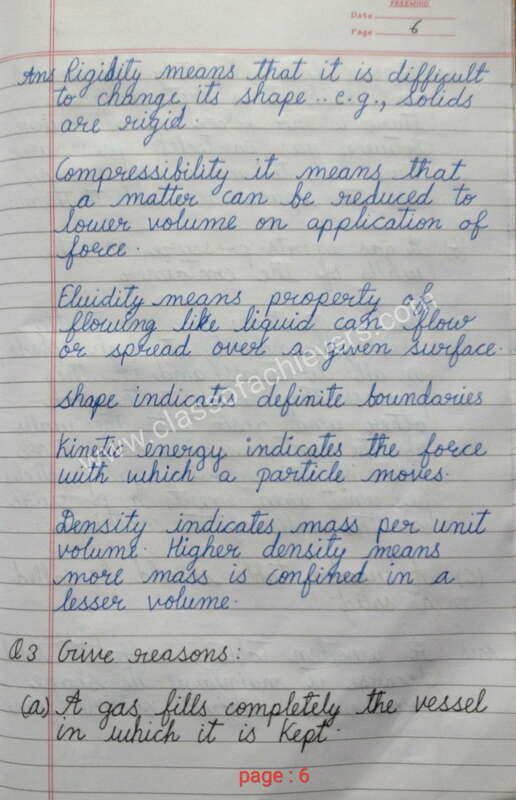 Liquids have less forces of attraction (between their particles), hence less mass and more volume as compared to solids, thus they have less density than solids. Que8. 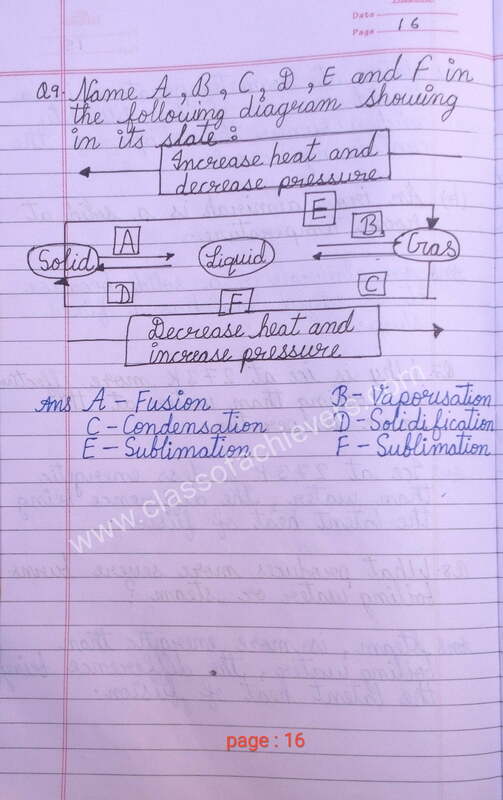 What is meant by latent heat of vapourisation ? Ans. 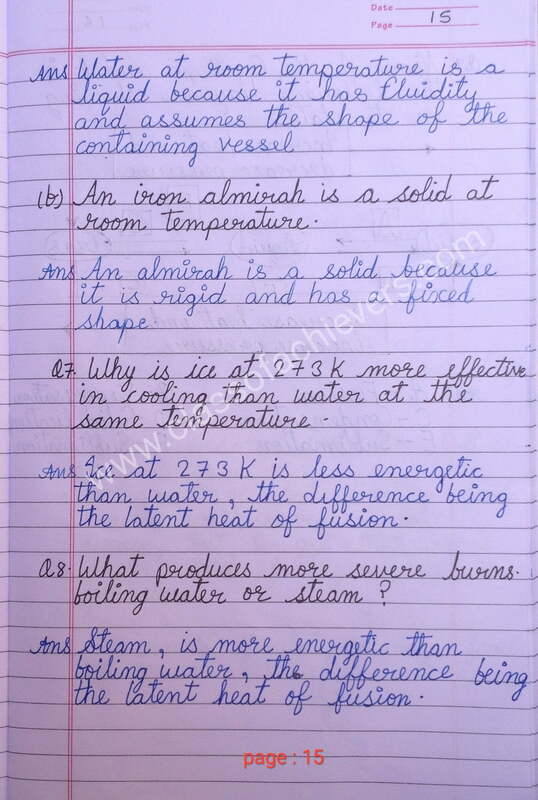 Since, boiling starts from the bulk, i.e. inside the liquid, therefore it is a bulk phenomenon. Que9. What happens to the melting point of ice when pressure is increased ? Ans. When pressure is applied on the surface of ice, the change into liquid form is assisted. Thus, melting point decreases. Que10. Why perspiration keeps our body cool ? Ans. 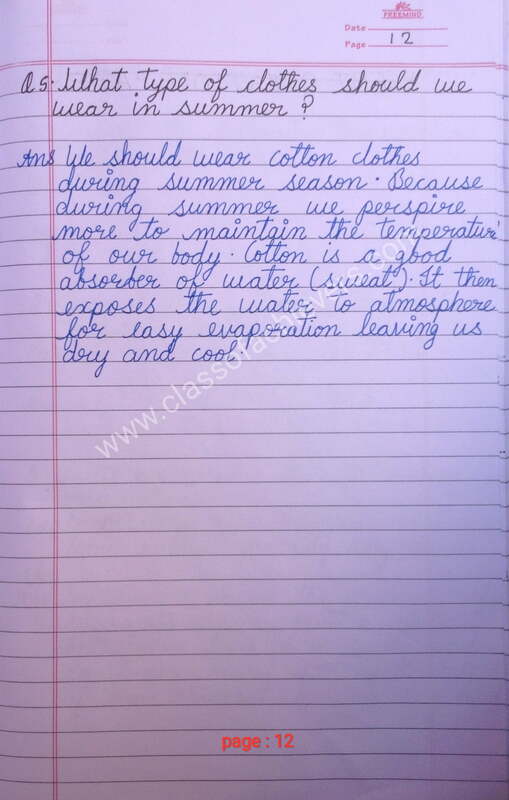 During evaporation of sweat, latent energy of vapourisation is absorbed from the body. This keeps our body cool. Que11. Carbon dioxide is a gas. Justify the given statement by giving two reasons. Carbon dioxide does not have a fixed volume. It can be compressed on applying pressure. Carbon dioxide does not have a fixed shape. It can take the shape of the container in which it is filled. Que12. 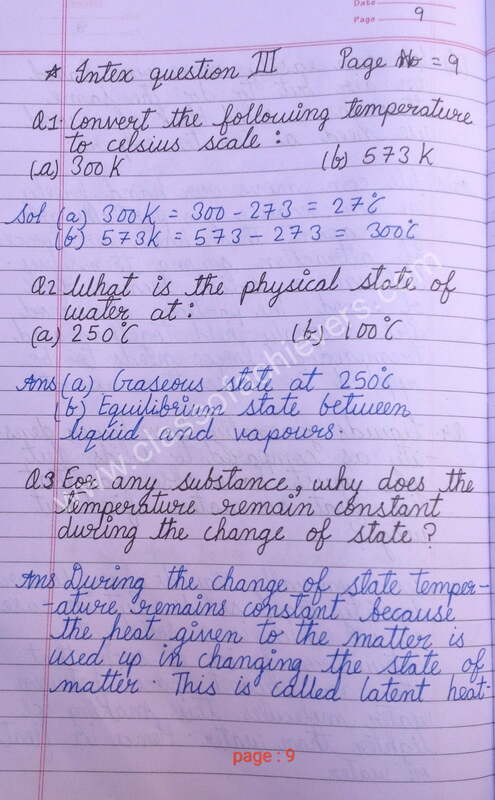 How change in temperature and humidity affect the rate of evaporation ? Ans. 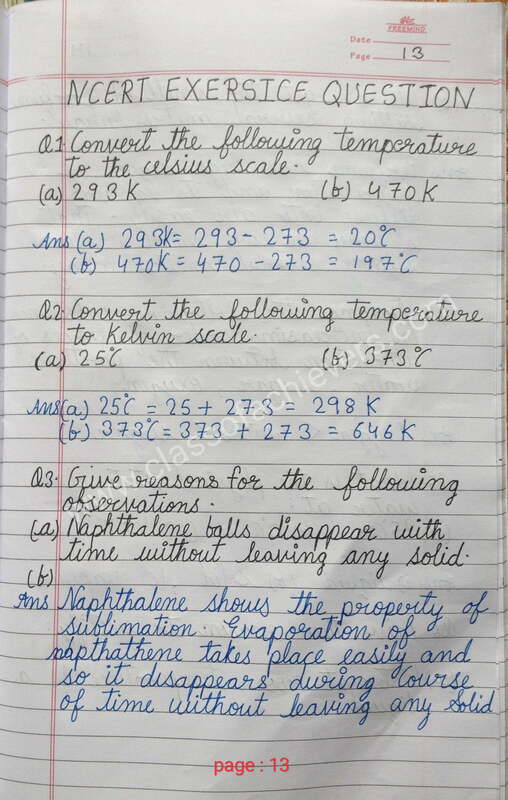 The rate of evaporation increases the temperature of the liquid. When the temperature of a liquid is increased by heating, more particles of the liquid get enough kinetic energy to go into vapour state. This increases the rate of evaporation. When the humidity of air is low, then the rate of evaporation is high and water evaporates rapidly. When the humidity of air is high, then the rate of evaporation is low and water evaporates very slowly.